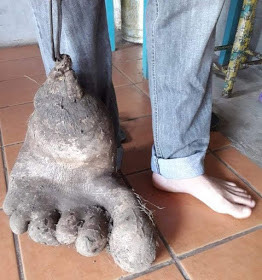 It is the eight-kilogram potato of mutant appearance that took the form of a human foot. Farmers Marli and Paulo Ciquinel discovered the scourge in the town of Meleiro, in the state of Santa Cantarina, in southern Brazil. 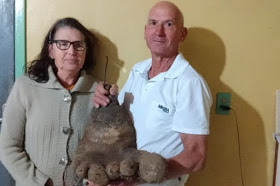 The photos show how the huge potato grew to look like a human foot, with toes going down in height. The largest of the toes is covered with roots that look like hair and the foot reaches almost knee height. The couple planted the potato in the kitchen garden behind their house where they also grow other vegetables. Marli told reporters, "We've never seen anything like this, let's see what we're going to do with the potato. "Maybe we can show it if someone wants to see it." He added, "I was a little scared when we harvested this potato."